July 29th is traditionally Rain Day in Greene County, Pennsylvania, a local holiday that celebrates annual rainfall on that particular day. This year, however, also marked the 100th anniversary of a World War I battle near Courmont, France, that took the lives of 18 Greene County boys – soldiers in Company K, 110th Infantry, 28th Division – frequently referred to as the Rain Day Boys. While many attended a memorial service honoring the 18 fallen at the Greene County Courthouse in Waynesburg, some Greene County residents payed homage at the actual site of the battle near Grimpettes Woods in France. 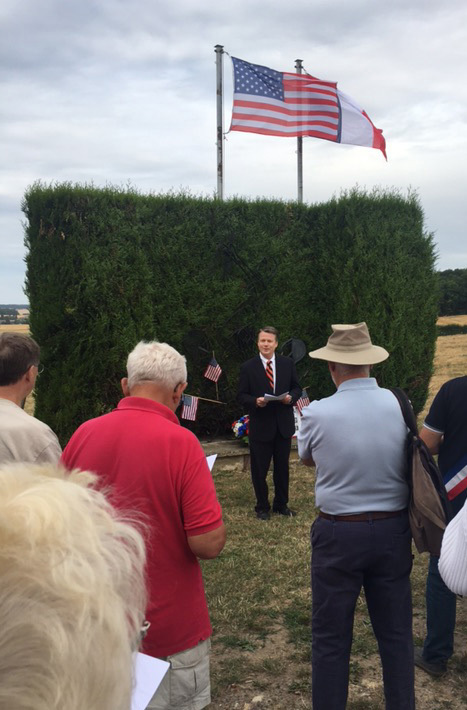 Present at the memorial service in France was Waynesburg University President Douglas G. Lee, who gave remarks and laid a wreath upon the monument placed at the top of the hill overlooking the battle site, which remains a working farm to this day. President Lee addresses those in attendance at the memorial ceremony. The journey to the battlefield was inspired by the research of Glenn Toothman and Candice Buchanan, who published “The Rain Day Boys: The Greene That Lay Near Grimpettes Woods,” a book about the young men and the battle that claimed their lives, many of whom were students or graduates of Waynesburg College. Toothman, founder/CEO of Memory Medallion Inc. and a former Greene County District Attorney, and Buchanan, a board-certified genealogist with a master's degree in public history from Duquesne University, both attended the memorial service at the battlefield. In addition to the individuals from the United States attending the service, there were a number of residents of the local communities in attendance. The mayors from the French towns of Courmont, Sierges and Ronchere laid wreaths at the monument. The battle site, which remains a working farm to this day.